Many Linux distributions area already available in LiveCD format, which is very convenient for the majority of users that don't want to create a partition on their hard drive to try any new distro on their computer, and if this system if convenient, the new system, LiveUSB, will be even better. Thanks to this system we will be able to take our favorite Linux distribution with us stored on our pendrive. 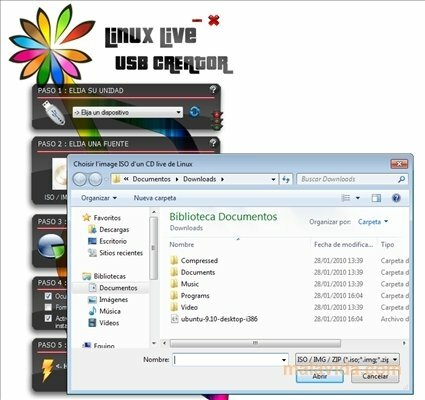 To be able to manage this, we can use a tool like Linux Live USB Creator, that allows us to create a LiveUSB with the Linux distribution of our choice from an ISO disc image or LiveCD. How the program works is really simple, because we only have to select the device, the source, the space on the pendrive that we have to use, and wait for the application to do the rest of the process. From now on you'll be able to take any Linux distro with you, thanks to Linux Live USB Creator.